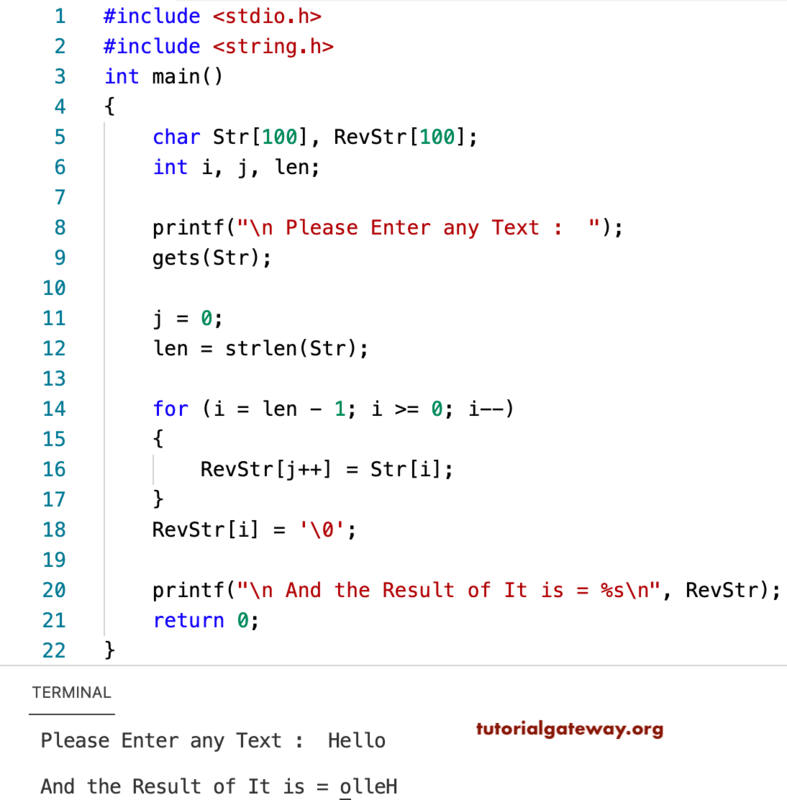 In this article, We will show you, How to write a C program to Reverse a String without using the strrev function with an example. To demonstrate the reverse a string in c programming, we are going to use For Loop, While Loop, Functions, and Pointers. This reverse a string in c program allows the user to enter any string or character array. Next, it will use For Loop to iterate each and every character in that string, and save the characters in reverse order. len = strlen(Str) = 5. The condition (4 >= 0) is True. The condition (3 >= 0) is True. The condition (2 >= 0) is True. The condition (1 >= 0) is True. The condition (0 >= 0) is True. Instead of storing a reverse string in the separate array, in this program, we directly printing the characters in reverse order. In this reverse a string in c program, we are using the temp variable to change the location of the character. It is something like swapping technique. This program to reverse a string in c is the same as above. However, this time we are using recursive Functions concept to separate the logic from the main program. This program to reverse a string in c is the same as above but this time we are using Pointers to separate the logic from the main program.